What is the WS467 Wall Switch? The WS467 is one of our more popular switches. It fits in the standard toggle style switch wall plates and is simple to operate and install. Simply press the button to control the light locally or use any X10 controller to control it remotely! It really is that simple. The WS467 is primarily used to control incandescent lighting. This unit does dim and also has a 'soft start' feature. The soft start feature ramps the unit to full brightness over a couple seconds when pressed and does the same when turned off. This action can save the life of your bulb and isn't as jarring as lights that instantly pop on and off when pressed. It is a nice, elegant feeling feature, but does require the unit it is controlling to be dimmable. If you are looking to control non-dimming alternative lighting (like LED, Fluorescent Lighting or Halogen Lighting) the WS13A On/Off Relay Switch may be a better option for you. The beauty of X10 is that it allows you to automate and control your lights and appliances remotely. Set your certain lights on a timer or turn on and off your house lights with a keychain remote before you come home. X10 is the most affordable option for home automation and the WS467 wall switch is a great example of that. What are the advantages of using the WS467 Wall Switch? 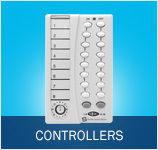 Enables remote control of lighting by simply replacing your current switch. Simple design allows for the use of your current standard toggle wall plates. What other products work with the WS467 Wall Switch?